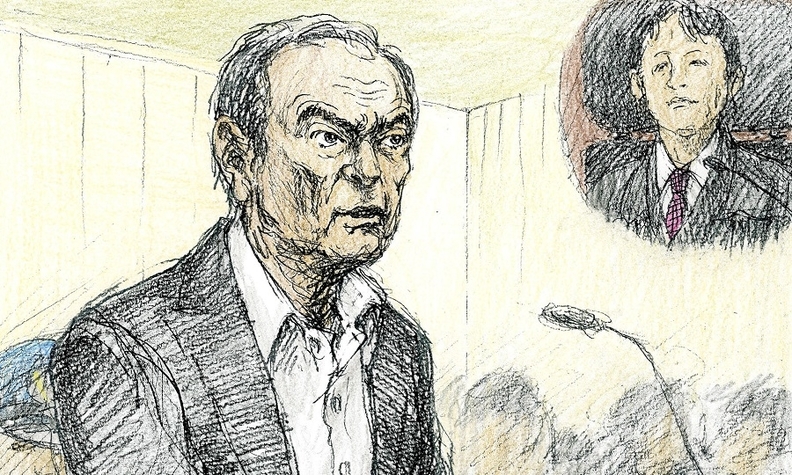 Ghosn, shown in a courtroom sketch, appeared in court looking thinner and with sunken cheeks. He appeared to have lost weight and his hair was graying at the roots. Sketch drawn by Nobutoshi Katsuyama (inset). TOKYO – A gaunt and graying Carlos Ghosn, appearing for the first time in public after nearly two months in a Japanese jail, told a Tokyo court Tuesday he was “wrongly accused and unfairly detained.” Ghosn mounted a point-by-point defense against the accusations facing him. The embattled former Nissan chairman, entered the Tokyo District Court morning in handcuffs, wearing a dark suit with no tie and green plastic slippers. The usually immaculately coiffed businessman looked thinner than usual, courtesy of his rice-heavy diet in detention. The gray roots of his trademark raven black hair were beginning to show. Inside the courtroom, Ghosn and his lawyers ticked off a four-point defense against the charges that up-ended career of one of the auto industry’s most storied executives and cast doubt over the future of the Renault-Nissan-Mitsubishi auto empire he founded two decades ago. It was a landmark day in the strange drama engulfing Ghosn, who has been held in detention since his Nov. 19 arrest and unable to tell his side of the story. His lawyers said they would petition the court to immediately end his detention, which was scheduled to run through Jan. 11. But even they held little hope of swaying the court. At a press conference held after the hour-and-a-half hearing, lead defense attorney Motonari Otsuru conceded his client would likely be indicted for a second time on Friday and be denied bail, keeping him locked up. Ghosn’s case, he predicted, might not got to trial for another six months. Otsuru denied a press report that Ghosn was being pressured to confess. Ghosn's son said in an interview published Sunday in the French weekly Journal du Dimanche that prosecutors have been pressuring his father to sign a confession in Japanese. “Not once has Mr. Ghosn said to us any concerns about being asked to sign something in Japanese, in a language he does not understand,” said Otsuru, a former lead prosecutor from the very division spearheading the investigation against his current current client. Ghosn has also been granted a bigger space in the Tokyo detention center, along with a western-style bed, instead of a futon mattress on the floor of a cramped cell, Otsuru said. But Ghosn has still been denied visits from family members and his own lawyers get only limited access. Investigators, by contrast, can interrogate him at length in the absence of his attorneys. Ghosn's day in court came courtesy of a rarely used Japanese legal maneuver in which suspects are allowed to petition the court to hear a justification of their detention. While it is unlikely to change the course of the case, it provided Ghosn a first chance to defend himself in public, influence the local media and stoke public opinion in his favor. Presiding judge Yuichi Tada read out charges and declared that Ghosn is being detained because he represents a flight risk and might tamper with evidence. In attendance at the hearing were the ambassadors of Lebanon and France. Ghosn is a citizen of both countries as well as Brazil. Outside the courthouse was a media circus, with journalists thronging the entrances and helicopters hovering overhead. Local media reported that more than 1,100 people had lined up for the lottery to take one of the 14 courtroom gallery seats allocated to the general public. In his statement, Ghosn emphasized his devotion to Nissan and his achievements in transforming it from a near-bankrupt national embarrassment when he arrived in 1999 into a “pillar of the Japanese economy” today. He cited figures to back up the radical revival. “We transformed Nissan, moving it from a position of a debt of 2 trillion yen ($18.5 billion) in 1999 to cash of 1.8 trillion yen ($16.6 billion) at the end of 2006, from 2.5 million cars sold in 1999 at a significant loss to 5.8 million cars sold profitably in 2016,” Ghosn said. “These accomplishments -- secured alongside the peerless team of Nissan employees worldwide -- are the greatest joy of my life, next to my family,” he said. Ghosn is credited with transforming Nissan into a pillar of the tripartite partnership that is now the world’s biggest auto empire. The Renault-Nissan-Mitsubishi alliance is stitched together in a complex, somewhat counterintuitive, web of cross-shareholdings. Renault has a controlling 43 percent of Nissan. But Nissan, the bigger, more profitable partner, owns just 15 percent of Renault and has no voting rights. Nissan also has a controlling, 34 percent stake in Mitsubishi. But Renault and Mitsubishi have no cross-shareholdings. Last year, it was the world's biggest auto group, with global sales of 10.6 million vehicles. After his stunning Nov. 19 arrest, Ghosn was indicted on Dec. 10 on allegations that he underreported some $43.5 million in deferred compensation that should have been reported in securities filings. If found guilty on that charge, he could face up to 10 years in prison. Since that indictment, he was arrested again on separate allegations of temporarily shifting ¥1.85 billion ($17.1 million) in personal swap contract losses to Nissan and having Nissan pay $14.7 million to a business associate who allegedly helped Ghosn handle the red ink. He has yet to be indicted on those allegations. In his remarks, Ghosn denied wrongdoing in both cases. Regarding the indictment, Ghosn said that the that the amount of deferred, post-retirement compensation had not been fixed and that he had never received any remuneration that had not been disclosed. There was nothing to disclose, he said, and he had no intent to violate the law. Ghosn made a twin-pronged defense against the grounds of the arrest for allegedly transferring personal losses. He admitted to leveraging Nissan as collateral against his swap losses but said that the loss-making swap contracts were transferred back to him at no cost to Nissan. He also said that the payments made to his business associate -- Saudi businessman Khaled Al Juffali -- were for legitimate business purposes, not some kind of payback for personal help. Ghosn said the Khaled Juffali Co. helped Nissan solicit financing and restructure struggling distributors in the Middle East region. He also helped Nissan negotiate the development of a manufacturing plant in Saudi Arabia by organizing high-level meetings with Saudi officials. Nissan, however, suspects that the payments to Juffali were actually payback for Juffali's assistance in arranging a new line credit line that helped Ghosn handle his swap losses. Otsuru later confirmed that Juffali did extend Ghosn 3 billion yen ($27.7 million) in extra collateral to help Ghosn in 2009, but he said it was unrelated to the later payments. Nissan alleges that Ghosn then used what’s known as a CEO reserve fund, normally used for unbudgeted, one-time expenditures, to pay a company owned by Juffali in four installments totaling $14.7 million over the four fiscal years from 2009 to 2012. A statement issued separately on behalf of the Khaled Juffali Co. said the payments were for supporting and promoting Nissan’s business strategy in Saudi Arabia. Among the assistance was help in enabling Nissan to secure a “significant” ownership position in the Nissan Saudi Arabia joint venture established with the Kingdom of Saudi Arabia. “Clearly, Khaled Juffali Company has provided manifold, tangible services that continue to inure to the substantial benefit of Nissan Motor Co., Ltd. and Nissan Middle East,” the statement said. Finally, Ghosn pleaded his contributions to Nissan. A Tokyo court has approved Ghosn's detention through Jan. 11, as prosecutors collect evidence and build their case against him, relying on a Japanese practice of interrogating suspects for hours every day in the absence of their lawyers. If prosecutors do not release Ghosn before then, in response to his lawyers’ petition, they must either indict Ghosn on the additional charges or let him go. Or, as is often the case in the Japanese system, they might also arrest him again on different but tangentially related grounds to continue holding him. If he is indicted, Otsuru said Ghosn’s lawyers would immediately apply for bail. Fellow Nissan director Greg Kelly, who was indicted with Ghosn as the accused mastermind of his suspect deferred compensation plan, was released on bail on Dec. 25.